August 15, 1965, a group of former teachers and state retired teachers held their yearly picnic at Lake Jackson. District Director Katherine McCall spoke to those present about the advantages of becoming affiliated with ORTA and explained the procedures the Chapter would need to follow to gain this affiliation. Following Mrs. McCall's presentation, a proposed slate of officers was nominated and elected and a committee was formed to write the constitution for the Jackson County Chapter. On September 15, 1965 a special meeting was held for the presentation and adoption of a constitution. The first year there were ninety-one members, including associate members. The late Donna Stanley served as District VII Director and in 1982 served as ORTA President. The late William C. (Bill) McDonald served as an executive board member and president of the Ohio Education Association. He later served ORTA and served on the State Teachers' Retirement Board. The chapter meets four times a year. 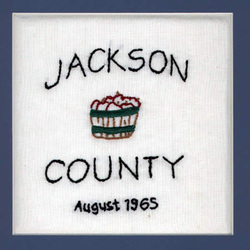 One meeting is held in each part of the county - Jackson, Wellston and Oak Hill, with the fourth meeting being held in Jackson on odd years and in Wellston on even years. Present membership includes ninety-six dual and seven associate members. The chapter awards two small college stipends each year. Members of the Jackson County Retired Teachers Association are very active volunteers in the community. Many serve as tutors in the local schools or at the county jail. Service organizations, clothesline/food pantry, church school, church choirs, Historical Society and Jackson County Apple Festival projects are some areas that keep everyone busy. The JCRTA presidents to date include: Mary Hannah Lewis Davis, Mary Lucas, Tilberry Dixon, Daniel F. Jones, Rev. Orlan C. Cooper, Anna Houser, Claude Swick, Esther Lloyd Dauber, Rev. John D. Davis, Reba Kisor, Eva Caulley, Vesta Wilson, Gomer Morris, Mary Houser, Helen J. Anderson, John E. Worthington, Margaret Benson, Viola Gettles, Hope Keller, Roxie Underwood, Susan Will, Wilbur McCormick, Sharon Needham and Georgia Gillfillan.